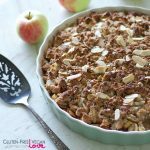 This simple vegan, grain-free, and gluten-free apple crisp has been a favorite go-to dessert (and frequently breakfast) around here for years. The first year I made this recipe, during apple season (when we had wild apples from the forest for days), I must have made this every sinlgle day — and that’s no an exaggeration. It’s a simple, wholesome family recipe we never get tired of around here and I especially love it because it only takes minutes to throw together and comes out great every time. I also love making apple crumbles like this because you can improvise with it a lot and add in all kinds of things — nuts, seeds, jams, berries, etc., so it never gets boring and it’s such an easy way to use up bits and pieces of whatever tasty things you’ve got leftover laying around. You can also easily swap the almonds for another nut of your choice. 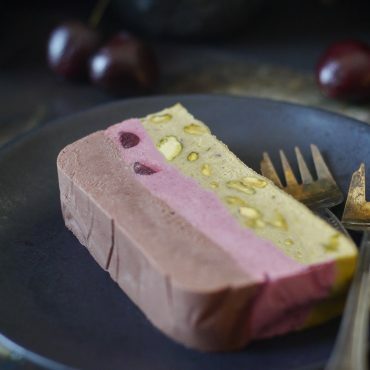 For a lighter version, I sometimes skip the crumble part, and just add in a ¼ cup apple butter or applesauce to the filling as the baked apple filling is wonderful on its own too (especially with some added cashew nuts and some non-dairy ice-cream or yogurt, or vegan whipped cream). You can also do this with other fruits. This balsamic peach crumble recipe is another variation on this recipe, for example. 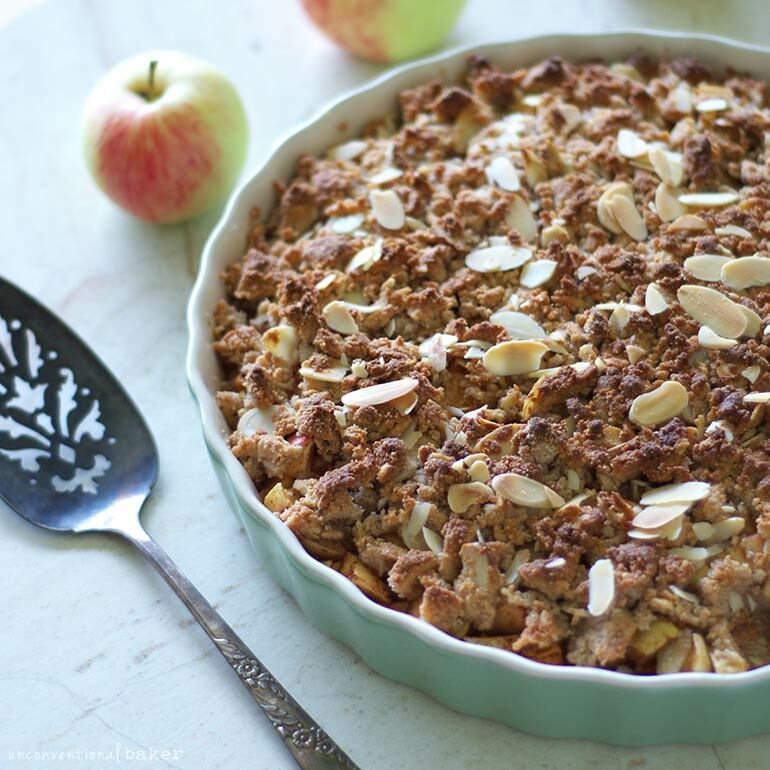 A grain-free easy apple crisp recipe, made with warm spices and topped with slivered almonds. 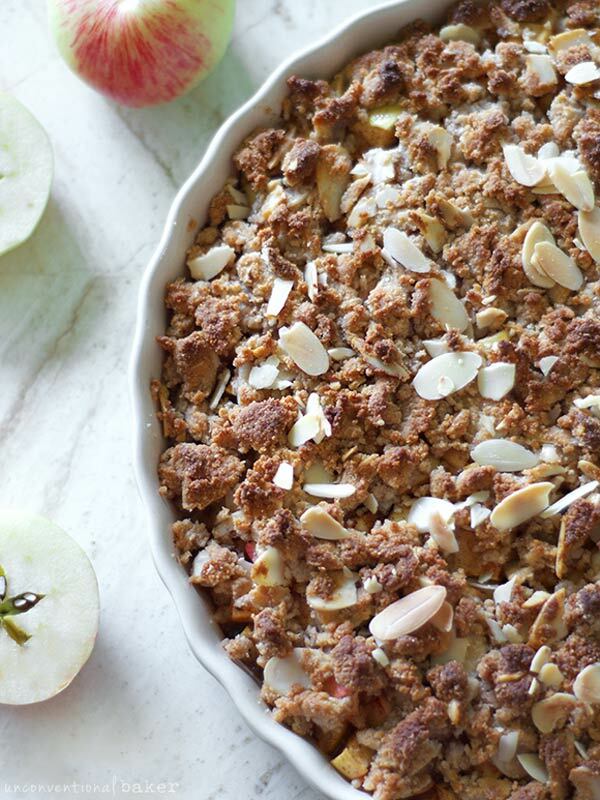 Vegan apple crumble with paleo options. 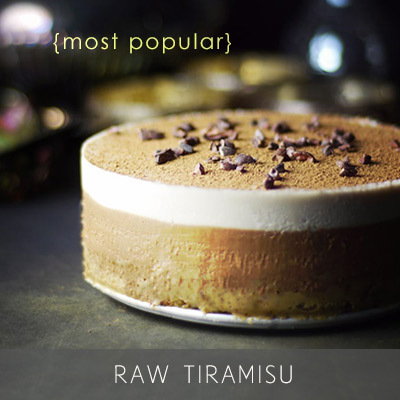 Naturally refined sugar-free and gluten-free. Preheat oven to 350F. Oil a pie dish (or any similar size pan) and set aside. Mix all filling ingredients in a mixing bowl. Transfer to the pie dish and spread evenly. Mix all topping ingredients (except slivered almonds reserved for garnish, if using) in a separate small mixing bowl until coarse crumbs form. Sprinkle this mixture over the apples in the pie dish. Garnish with slivered almonds if desired. Bake in a preheated oven for approx 30 minutes, until the crumble turns golden brown. Remove from oven and serve immediately (with a side of vegan vanilla ice-cream, non-dairy yogurt, or whipped cream — highly recommended) or chill if you like your apple crumble cold (makes a great gluten-free vegan breakfast!). Enjoy! 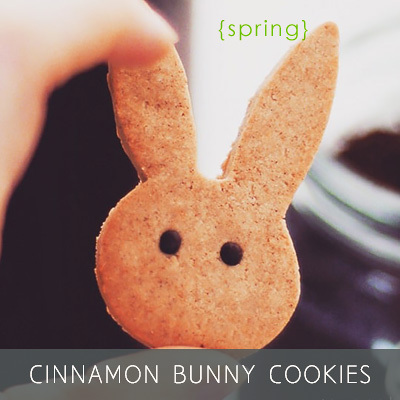 Disclaimer: this post contains affiliate links to the following products: cinnamon, allspice, nutmeg, cloves, maple syrup, almond flour, slivered almonds, sliced almonds. Hi, can this be made ahead of time? Can’t wait to try it but I’m taking it to a dinner for dessert and baking it there. Hi Byul. Absolutely. It’s good fresh out of the oven and warm OR chilled in the fridge overnight. So can definitely be made ahead. It transports easily too. Enjoy! This would render this crumble no longer vegan. Perhaps whipped coconut cream would be a better suggestion. Hi Jenny. I’m sorry it didn’t work out for you. I have many friends who make this recipe with honey and it works well for them. I wonder what might have gone wrong. Can you describe what happened to the crumble? This crumple turned amazing!!! Keeping the recipe for sure :) thanks! Hi Brandon, absolutely if that’s what you prefer. Enjoy it! Aw, thanks for the beautiful feedback, Michelle! I’m so happy you liked it. 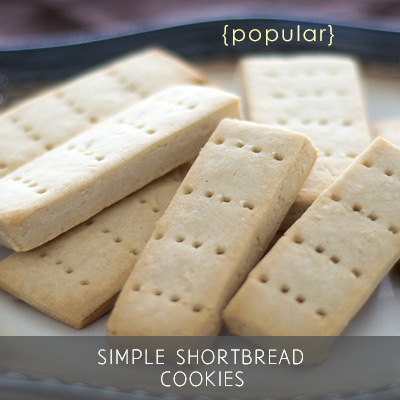 I agree — it’s a very easy one, even for those afraid of baking :) I used to make it so often I could do it with my left hand and my eyes closed — when it got simplified to that point I wrote it down and shared it here ?? 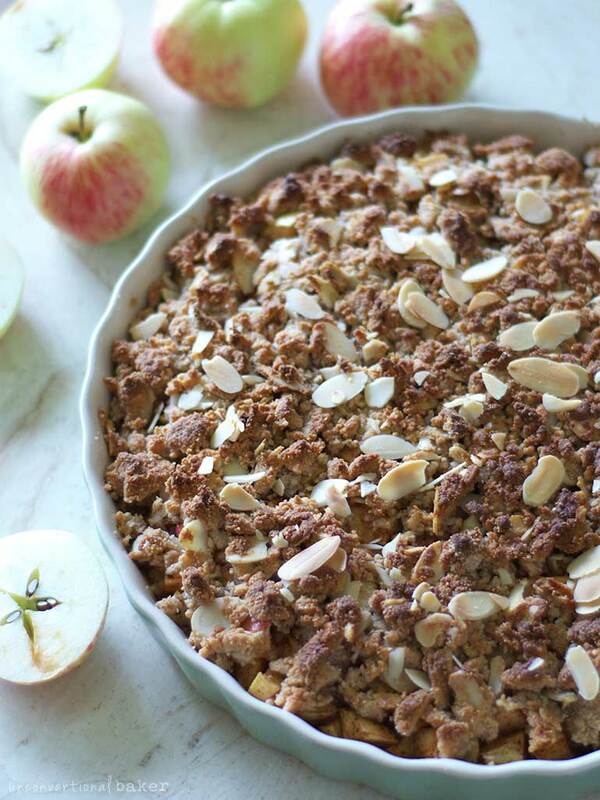 Your Apple Crumble looks absolutely beautiful! I love the addition of the maple syrup and that it is suitable for so many special diets too. Thank you for sharing it with us at the Hearth and Soul hop. I like how versatile this recipe is, apples are favourite of mine especially in crumbles. Thanks for linking up to Sweet and Savoury Sunday, stop by and link up again. Have a great day!! I love pretty much anything with apples and cinnamon it it, so I know this must be delicious! 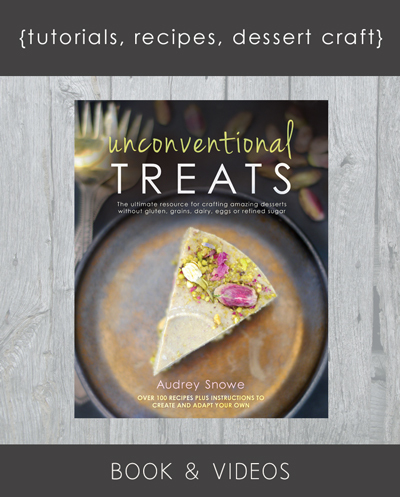 I’m featuring it this weekend at Savoring Saturdays – I hope you’ll be able to come share with us again, Audrey! Thanks so much, Raia! I’m eating another apple and cinnamon dessert as we speak :) I’ll be sure to share it once it makes it up on my blog. Thanks for the party and for the feature! this looks like a recipe right up my alley, I must try this! thanks for sharing and visiting! 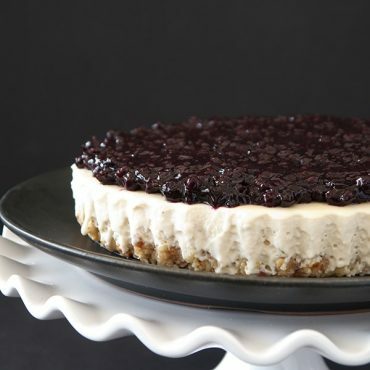 Can you use coconut flour in this beauty? Hi Kay, do you mean use coconut flour in place of almond flour? If so, I’d use 1 cup coconut flour + 1/2 cup shredded coconut or some nuts just to give it a bit of a coarser/crumbly texture. A mix of coconut and almond/another nut flour would work well too.